Ala Littoria, Italy's state airline from 1934 to 1945. The company logo on a background of it's legendary car bodywork color is the thing to do, and I guess that this is the design every one would come up with when creating or deducing an Alfa Romeo flag. There a string of ornament plain color triangular flaglets, both in red and in white, with the Alfa Romeo logo counterchanged in in this Fiat merchandising website (Fiat company owns the brands Fiat, Alfa Romeo, Lancia and Abarth, plus a bunch of extinct ones). However the official flag of Alfa Romeo seems to be white with the logo as shown in said Fiat merchandising website. Note that the image is not a photo of a real flag (unlike other merchandising) but also a computer- generated picture. At www.the-flag-center.com, there is another white flag with the Alfa Romeo logo, this time with lettering, red, in the usual brand style and face. Either version would be the official one, if theres such a thing. On most flags the logo shows shadowless, as well as in standalone depictions (i.e. www.alfaamore.hu), but that depends solely on the technical constraints of the used medium. The current official version seems to include shadows and metallicity (i.e. www.presse-fiat.de (this version used after 1972). 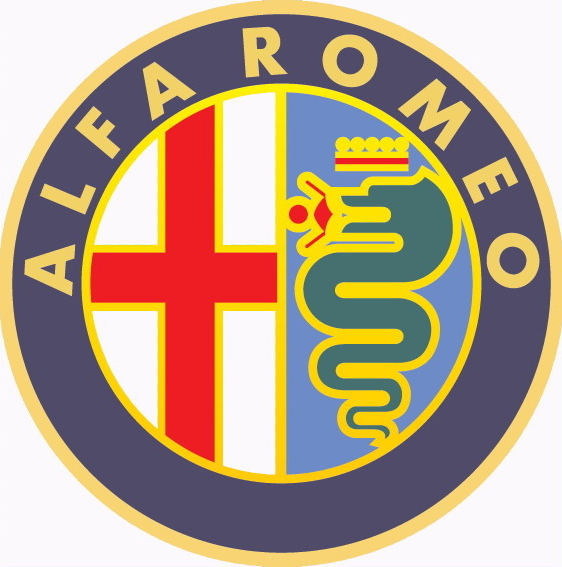 The logo of Alfa Romeo is a seal-like circular device based on a heraldic impalement of the following arms: Milan city (Argent a cross Gules) and Visconti family (Azure a serpent Argent coiled crowned of the Same and swallowing an infant Proper). The latter arms are modified to show the serpent in green and its background in light blue, and the current depiction (1972 onwards) shows golden fimbriation around all objects. The seal border is dark blue and bears the lettering "Alfa Romeo" in wide-spaced solid bold golden capitals, from 9:15 oclock to 2:45. The logo history of Alfa Romeo seems to be well researched; the lettering having been white/silvery before 1972, with less fimbriation and "Milano" on the bottom of the border (dropped as a factory opened in Naples), and separated by two coils of rope, shaped as Savoy knots (for the King) before 1946 (See joint image: at www.asaf.co.il and also at thebiggestsecretpict.online.fr and at it.wikipedia.org. While "alfa romeo" matches the ICS letter nicknames for "A" and "R", these signal flags were never included in the brands emblems. (On the contrary, the brand precedes the said flag/letter nicknames, as the name was adopted in 1920, joining A.L.F.A., Anònima Lombarda Fàbbrica Automòbili, with investor Nicola Romeos surname). The serpent (biscione, see wikipedia) is sometimes used exclusively to symbolize Alfa Romeo, leaving aside the rest (i.e. www.international-auto.com. A shamrock is sometimes used to symbolize Alfa Romeo, but I could find no further info on this, neither evidence of its use on flags. Alfa Romeo factory workers use red flags with golden yellow lettering including the commissioned lettering (but not the seal-logo), as shown in wikipedia. For more details see also en.wikipedia and it.wikipedia. The Alitalia logo is one of the more common, as well as one of the more striking airline logos. I recall seeing the Alitalia flag several times; it simply consists of the logo on a green background, although my impression is that the shade of green varies considerably (this is probably not due to company policy but to the availability of green cloth!). Since the logo is a lettering of green letters with the distinctive red stroke of the initial "A" usually on white background, when on green background (as usual for logos) the letters become white themselves. (I'm supposing this is meant as the full logo, not the shortened "A" logo, as used on the rudder. seems to be a blanket labeling for all airline logo images in this site. 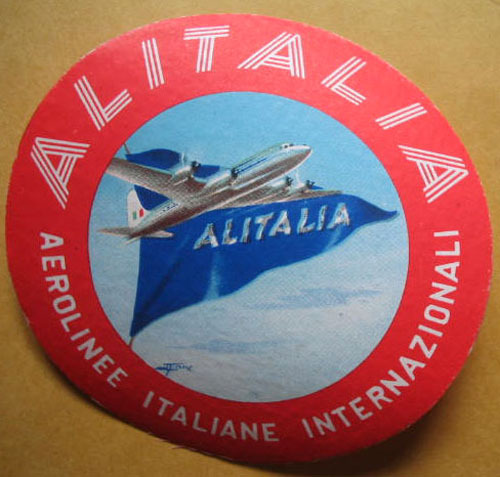 This old Alitalia sticker shows a blue pennant bearing the carrier's name in white letters at www.locomobilia.com. The former flag of Alitalia, in use 1947-1969. Source: I.O. Evans, The Observer’s Book of Flags, Frederick Warne, 1971, page 203 [eva71] and earlier editions. While watching a BBC World TV report on the last voyage of the Costa Concordia, there appeared in the far background during the comments of the Italian PM, a flag as attached. 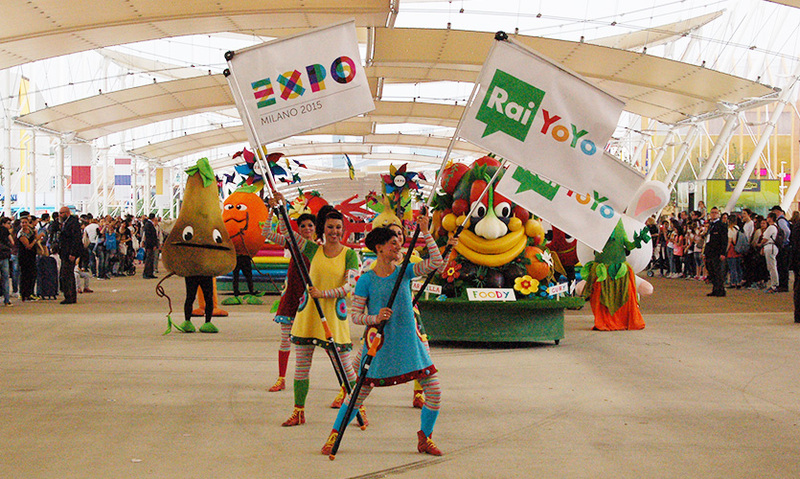 "Rai Yoyo is an Italian specialty TV channel owned by the public broadcasting group RAI (Radiotelevisione Italiana S.p.A., official websites: http://www.rai.it/ and http://www.rai.tv/). It was established on November 1, 2006"
images by Eugene Ipavec, 28 July 2010I spotted this Versace flag in Milano, Italy, right outside their store on Via Montenapoleone on May 22, 2008 during a trip there. It is the Versace emblem on a white background. The emblem can be seen on the official Versace website at http://www.versace.com/flash.html. "Gianni Versace S.p.A., usually referred to as Versace, is an Italian fashion label founded by Gianni Versace in 1978. The first Versace boutique was opened in Milan's Via della Spiga in 1978, (though the Versace family are from Reggio Calabria) and its popularity was immediate. Today, Versace is one of the world's leading international fashion houses. Versace designs, markets and distributes luxury clothing, accessories, fragrances, makeup and home furnishings under the various brands of the Versace Group." The logo is a Medusa.